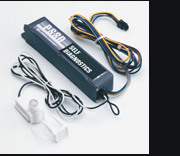 Power Sentry reduced profile products feature an innovative Quick-Disconnect wiring harness that makes field maintenance and upgrades quick and easy. Once the wiring harness has been installed no additional wiring will be required for the life of the fixture. The reduced-profile Power Sentry housing is designed to fit into the tightest of applications. Integral test switch/pilot light is less obtrusive and installs in half the time. Self-diagnostics module (PSSD) can be factory- or field-installed with the PSQ500QD, PS600QD, PS1400QD and PSDL3.